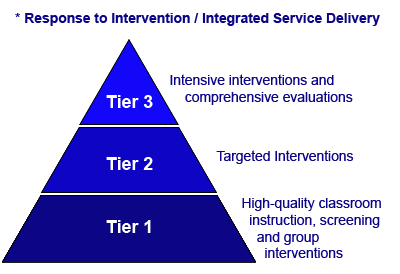 Response to Intervention (RTI) is a multi-tier approach to the early identification and support of students with learning and behavior needs. The RTI process begins with high-quality instruction and universal screening of all children in the general education classroom. Struggling learners are provided with interventions at increasing levels of intensity to accelerate their rate of learning.